From the time I was in middle school, the Lord was calling me to serve Him in missions in some capacity. My youth group leader gave me books like “Called to Die” and “Through Gates of Splendor”, the stories of Chet Bitterman and Jim Elliot. The stories of men living and dying for Jesus greatly impacted me as I explored what it meant for me to serve Jesus. In college I went with my soccer team to Argentina on a short-term missions trip, which God also used to move my heart in the area of missions. After college I went on a short-term missions trip with my dad to Ukraine, and the Lord confirmed His leading on my life to serve Him overseas. After Rochelle and I met and got married, we were seeking the Lord together for where in the world He would have us serve. In the meantime, we worked with international students studying at the University of South Carolina with the organization International Friendship Ministry in Columbia, SC for three years. Altogether, Rochelle and I prayed for seven years about where God wanted us to serve! We researched ministries, locations, and opportunities, talked with people, received and prayed over various invitations to join different areas of service until some friends of ours invited us to join a church planting team in Odessa, Ukraine. In 2002, we joined TEAM and two years later found ourselves in Krasnodar, Russia for two years of intensive language and culture study. Then in 2006, our young family moved to Odessa, Ukraine. Our role when we first came to Odessa was learning more about the culture and what it meant to serve on a team, partnering with established churches in the region, and establishing ourselves in the community. God opened up many opportunities for ministry through building relationships with people around us. The ministry in Tairova has looked different at various times, but at its core, we have always been about serving people and sharing Jesus with them in relationship. Whether through teaching English in private schools or in courses, backpacking, soccer, home cooking classes, a country music club (ask me about what that was like! ), teaching science, or a community recycling program, ministry here is all about relationships and sharing the beauty of Jesus among our friends and neighbors here. The Lord planted the idea of serving Him cross-culturally when I befriended a Japanese exchange student in high school. When my friend was preparing to return home after her year in America, she invited me visit her in Japan. I thought that since Japan was so far away, it was unlikely that I’d ever see her again. However, the Lord had different plans. While studying at Grove City College, I applied to the school’s Red Box Missionary program, which sponsors 2-3 students to go out on a short-term missions project each summer. I was selected and ended up going to Japan to serve with a local church there. In the end, I did get to meet my high school friend in her home country! After that trip, I felt that this was not the last time I would serve overseas. After graduating from college and while working at Grove City, it was a conversation with my boss about missed opportunities and stepping out and trying new things that the Lord used to spur me on to go back to Japan. This time, I went as a teacher in an English tutoring company and was actually in the same area of Japan I’d visited before, so I was able to reconnect with the church I’d served with on my previous trip. The Lord provided community through the church and through others that greatly impacted me during my year overseas. One specific family taught me what hospitality looks like by opening their home to me and other short-termers in the area, which greatly impacted me. After that year, I returned home, again with the feeling that this was not my last time overseas. While back in Ohio, the Lord gave me opportunities to befriend and serve Japanese families in the area through English teaching for their children and baking/cooking times with the ladies. After moving to Indianapolis, I met Kurt, whom the Lord had also been preparing to serve cross-culturally. From the very beginning of our relationship, we knew that we both desired to serve the Lord overseas and as we dated and then got married, God continued to confirm His calling on our lives. We moved to Columbia, SC where Kurt attended seminary at Columbia International University and I worked in CIU’s admissions department. While in South Carolina, we were surrounded by a great church that was family and missions-focused, was heavily invested in working with international students, and greatly encouraged us as we prayed and sought where God would have us serve in the future. Ironically, our house in Columbia was right next to Russian Language Ministry’s Russian Immersion house, and we had many opportunities to relate with and encourage the students. 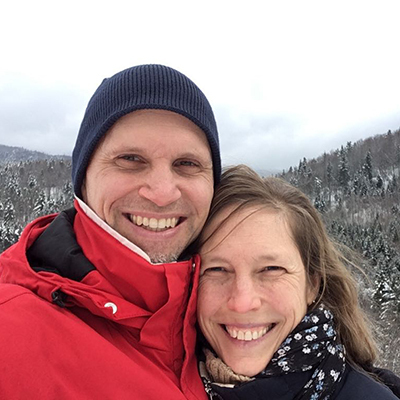 Soon after graduating seminary, we moved our family back to Kurt’s home state of Michigan to reconnect with his home church for a few years and continue to seek where God wanted us next. It was there that our friends, missionaries with TEAM, approached us to pray about joining a church planting team being formed in Odessa, Ukraine. We had been praying for seven years about where to serve, and when we heard about this opportunity, we knew it was where God wanted us. A few years later, we left for Krasnodar, Russia to attend Russian language school. After two years of language and cultural study, we joined the team in Odessa, Ukraine and have been serving here for the past 12 years. The ministry in the Tairova region of Odessa centers around discipleship: walking with people together as we focus on growing closer to the Lord, pointing people toward Jesus who don’t know Him yet, and encouraging those who know Him to love Him more. We will do just about anything to be around people! We’re always looking for ways to serve people in the community and share Christ with them. Our ministry activities look different depending upon the context we find ourselves in. For example, ministry on some days has looked as different as going skiing with friends, walking on the beach, community clean-up days in and around our apartment, or repairing something for our building. Another awesome and unique part of ministry in Tairova is our New Life Plastic program. God has used it to foster great conversations about the Lord and begin relationships with people I’d otherwise never meet! Read more about the program here. Church in our context is structured in a way that has a low emphasis on structure and a high emphasis on relationships. We meet in homes, take turns sharing and leading, and worship God through singing, praying, and reading Scripture together. This creates long-term sustainability and reproducibility with low overhead, which works well in our city context. We love partnering with other churches and ministries, such as ministries to orphans, ESL teaching, backpacking, seminars and trainings, with CRU (Campus Crusade for Christ), marital counseling, partnering with people in business, coaching, and encouraging other missionaries/workers. We love when short-termers come! We see them and their service as not only a tool to further ministry here in Tairova, but also as an opportunity to disciple them and walk with them as they grow in the Lord. Short-term missions, we hope, has been as encouraging to them as it is to us, and helps us all to learn and grow together. My role on TEAM Ukraine involves ministry to my family, evangelism and discipleship with women, and hospitality ministry. Whether it’s sharing life with kids and their moms on the playground, interacting with parents at school, listening and praying with women over tea, cooking meals for men working in the plastic recycling program, or fitting one more friend around a crowded dinner table, I am thankful to be serving the Lord and growing His church here in Odessa. I love being able to sit down one-on-one with someone, hear her story, and share the truth of the Gospel. Though life in Odessa rarely looks the same each day, I am thankful for opportunities to pray and point people to Jesus in all things. That we would stay close to Jesus and have ears to listen to His leading daily.